Arthroscopy is a minimally invasive surgical technique that involves several small incisions into which a fiber-optic device (arthroscope) and tiny surgical instruments are inserted. Orthopedic surgeons can diagnose and treat many different shoulder conditions with arthroscopy, while patients can benefit from less tissue damage, shorter recovery times, less scarring and less post-operative pain. 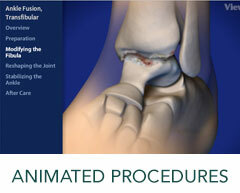 This technique also avoids cutting any muscles or tendons in order to gain access to the affected area. The arthroscopy procedure is a same day procedure and rarely requires an overnight hospital stay. It is typically performed under general anesthesia with a regional nerve block to help reduce post-operative pain. To learn more about our Shoulder Arthroscopy Services, please contact us today to schedule an appointment!